Ideal for use in office environments, libraries and computer labs, B6 Series monitors deliver dynamic and energizing visuals thanks to their high display resolution and true-to-life colors. They also feature an ergonomic design for comfortable all-day computing, and they use eco-friendly technologies to save power and cut energy costs. Focus more clearly on your tasks thanks to the very high resolution of these monitors. Choose from WQHD resolution all the way up to Ultra HD (4K2K) resolution, which delivers four times more pixels and detail than Full HD. Work comfortably for hours with Acer B6 Series monitors. Acer ComfyViewT technology reduces glare, for greater eye comfort. In-Plane-Switching technology lets you see perfect images from wide viewing angles, for even more clarity and comfort. 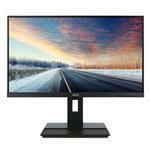 These monitors deliver 100% sRGB coverage, for perfectly recreated colors. Some models feature 6-axis color adjustment, which lets you fine-tune the colors for amazing color accuracy. Find a working angle that's perfect for you with the Acer ErgoStand1, a stand that lets you easily adjust the screen's height, as well as letting you tilt and swivel it easily. Another great feature of the ErgoStand is that it allows you to effortlessly rotate the screen to portrait mode. Professional Series monitors comply with RoHS, EPEAT Gold, TCO, and ENERGY STAR 6.0 requirements. Their Acer EcoDisplay design plus white LED backlighting yield significant power savings. More than 10% of the material used in these monitors is post-consumer recycled (PCR) plastic, further reducing environmental impact. The 10% figure does not take into account internal wiring or cables.